You’re tracking your total closed sales, but what about your sales pipeline? Your pipeline shows the total amount of business you tried to close in a given period of time. For example, insurance agents track the total amount quoted, allowing them to compare this to the total amount actually sold. Tracking your pipeline allows you to better forecast sales and pinpoint where you are falling short. Quotes or proposals can be entered in dollar value to Blitz Lead Manager’s opportunity tool, allowing users to run pipeline reports as well as tracking on an individual basis for lead nurturing. 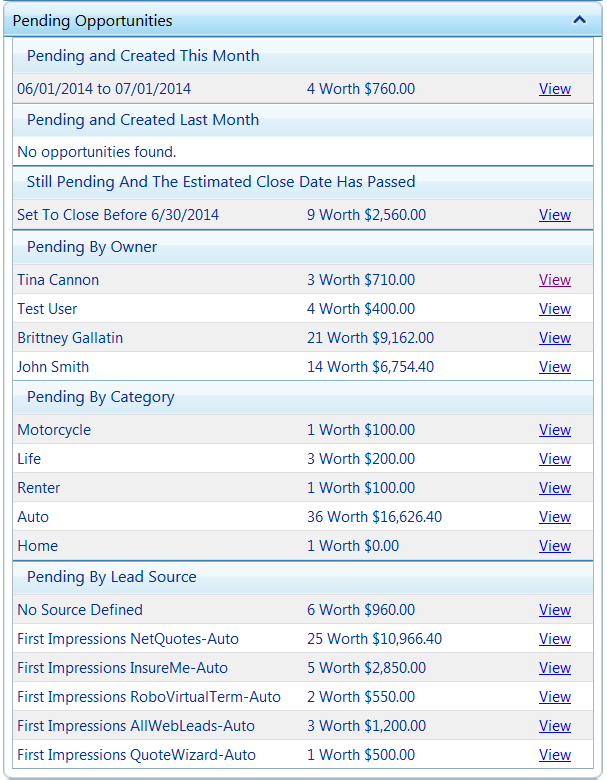 On the My Blitz homepage, Administrators will have access to a broken down report of all pending sales opportunities. Total pipeline this month and last month. By tracking each month you can more accurately forecast sales in the future. Which sales should have been closed by now. The “still pending” section shows quotes you expected to close by now. It’s important to keep an eye on these to prevent lost opportunities. Pipeline for each user (owner) allows your business to track by individual sales rep. Pipeline by product or service (category) allows you to see which areas of your business is generating the most interest or potential revenue. Pipeline by lead source allows businesses to evaluate who they are targeting. Each section has a “view” link available to show more details, and allows for additional data manipulation. Users are able to export the data to create sales trend reports and more.